Let me start by saying this is one of my favorite brunch spots in Montreal. They have a terrace at the back of the restaurant that is surrounded by trees, plants, and hanging lightbulbs recreating an enchanting corner. Beauties approved by Lucia Ortega. This place is packed every day from 4 pm till late, so I am thinking they must be doing something right. The terrace is in the back, hidden under the trees right next to the park. Food: Yes. They offer oysters, poutine, hamburgers, mac n' cheese, etc. Price: $ Food consumption necessary to be able to order alcoholic beverages? No need to order food. One of Montreal’s best-kept secrets, Les Filletes is one of those places that only the neighbors know about. The terrace is behind the restaurant, which means it stands away from the noise of the street. I walk past it every day and there’s always good -healthy- ambiance at night. Sitting there, outside in the street, feels exactly like being in a Parisian café. The ambiance is very calm, excellent to go in the afternoon with a close friend for a cup of coffee or a glass of red wine. Food: Yes. Salads, sandwiches, and viennoiseries. -très francais- Price: $ Food consumption necessary to be able to order alcoholic beverages? No need. The patio is excellent for the summer. Chill vibes, casual concept. Good beer, good bourbon. Something for everyone. Photo Credit: Bernard Brault, La Presse. With a signature decor from Zébulon Perron, this is the place to come have a good meal that you can actually share with friends. The terrace is right in the middle of the action in Avenue du Parc. Beauties approved by Marie Michele Berniquez and Léa Bégin. Food: Yes. The menu is simple and delicious. Price: $$ Food consumption necessary to be able to order alcoholic beverages? Nope, not necessary. Natural wines & fresh oysters, no beer. The customers are usually the type “young but with a serious job” this place fancy but not in a pretentious way. Beauties approved by Léa Bégin. Food: Yes. Small plates and seafood dishes. Price: $$ Food consumption necessary to be able to order alcoholic beverages? Not necessary, it´s a bar. The location is ideal if you want to go out clubbing after. The decoration inside is so nice, full of plants and lightbulbs. The lighting of the place can get pretty dim, so if you want to eat there try to go before night time. Beauties approved by Gabriella Hachem. Food: Yes, grilled cheese and hamburgers. Price: $$ Food consumption necessary to be able to order alcoholic beverages? No at all. Food: Yes. Apparently best sandwiches in town. Price: $ Food consumption necessary to be able to order alcoholic beverages? No. Cocktails on point, beers, wines, and sparklings. The whole gang is there! This terrace is casual... but casually chic. They renovated their terrace last summer and it's beautiful. Beauties approved by Lea Begin. Food: Yes, and they have some vegan options too. Price: $$ Food consumption necessary to be able to order alcoholic beverages? Not necessary. Haitian vibes = exotic vibes. Everyone who has gone once comes back. The music is good, but the people are better. It gets full pretty fast, so get there when it opens. Beauties approved by Léa Bégin. Oriental Brasserie with a nice little terrace at the back. This is one of the most casual terraces in Montreal, but the people that go there represent the perfect mix of cultures that this city holds and that's what makes it so much fun. Food: Yes, and it looks amazing. Price: $ Happy hour every day from 4-8 PM. Food consumption necessary to be able to order alcoholic beverages? No, not necessary. Elegant A.F. A unique environment that brings together design, gastronomy... and a huge painting of Stikki Peaches! Beauties approved by Clara Duvernay. Food: Yes, but... Price: $$$ (a bit overpriced for the quality. Have a drink and an appetizer to enjoy the terrace!) Food consumption necessary to be able to order alcoholic beverages? Yes, you need to order food. Pronounced "vor", this Scandinavian style restaurant is something else. The ambiance is effortless and easy-going. Hvor means "where" in Danish. Beautiful colors, great light, lots of greenery. One of the most beautiful terraces in Montreal, it is as good as it looks. Beauties approved by Juliette Cordeau! Food: Yes, Japanese style fusion. Price: $$$ Food consumption necessary to be able to order alcoholic beverages? No, it is not necessary to order food. Urban and connected; the reliable go-to resto-terrace, aaaaand they are neighbors to Cafe Parvis! Excellent duo of terraces. Beauties approved by Dominique Lawrence! I discovered this terrace while driving around downtown looking for a place to brunch. Suddenly I had a glimpse of the entrance of Boris Bistro, from the other side of the road, and I asked the person driving to stop so I could cross the street and go see this amazing place. Two weeks later I went there again for dinner and the food was superbe (read with a French accent). By far one of my favorite terrace in Montreal. Food: Yes. Perfection Price: $$$ Food consumption necessary to be able to order alcoholic beverages? Not necessary to order food. This is a more chill and casual terrace. Located along the Lachine Canal, it is excellent to go take a beer and share a pizza with a big group of friends. Food: Yes. I only recommend the pizza though. Price: $ Food consumption necessary to be able to order alcoholic beverages? Not necessary. Gorgeous italian gem! Fresh food and the design is on point. You wanna know more about the chef? Click here for a full article about the restaurant! Food: Yes, Naturally leavened pizza + natural wines. Price: $$ Food consumption necessary to be able to order alcoholic beverages? Yes, it is necessary to order food. Sustainable and responsibly sourced. I love it! The terrace is charming and relaxing, surrounded by beautiful plants to set up the mood for a freshly made meal. New gem! Welcoming for everyone who enjoys coffee and... CLASSIC COCKTAILS. Food: Yes, they serve conservas (tapas) and embutidos (charcuteries). Price: $$. Food consumption necessary to be able to order alcoholic beverages? Not necessary. The ambiance is definitely more of a university one, and this makes it casual and fun. Quiz nights are every Monday night at 7:30 pm and they are hosted by Quizmaster Kenny or one of his talented crew. Beauties approved by Anne St-Onge. Food: Yes, pub style. Price: $$ Food consumption necessary to be able to order alcoholic beverages? Not necessary. The food is good and fresh. They have a small terrace in front that is always full so make sure to get there early. Wine and cocktails on point. Food: Yes. They serve handmade pasta!!! Price: $$$ Food consumption necessary to be able to order alcoholic beverages? No, not necessary. What a cool and original bar. You will find it floating in the Lachine Canal close to Atwater Market. It reminds me of a floating bar/club in Lyon, France or a typical cafe in Holland. Definitely, a must try this summer. Food: Yes, snacks. Price: $$ Food consumption necessary to be able to order alcoholic beverages? No, not necessary. This Italian cafe has a very chill terrace where you can take a delicious lunch or go for a 5@7. Be patient because there is always a lot of people, even though this is their second location. Oh, and they say the gelato there is yummy! Beauties approved by Juliette Cordeau. 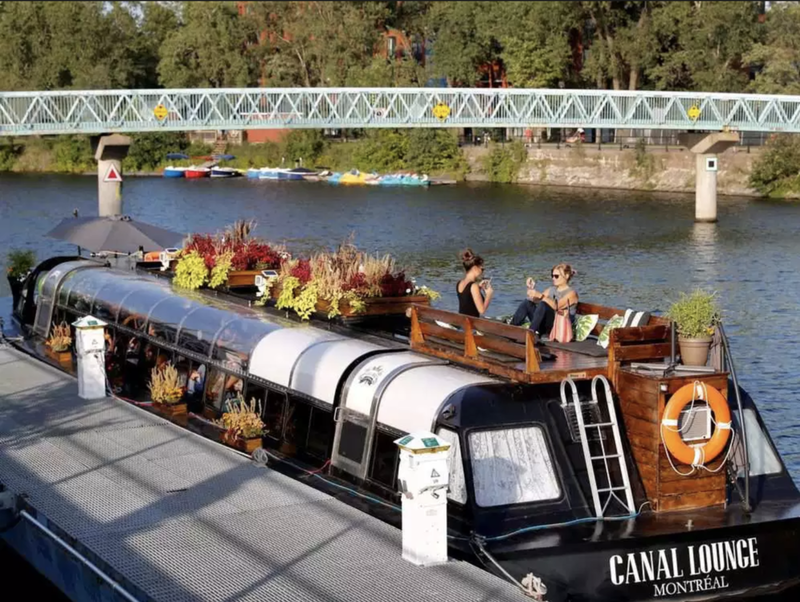 A gourmet style market floating on the Lachine Canal? I love it. This is one of my favorite spots in Montreal. There are a lot of options for drinks and food, and if you are in doubt… go to Pastaga, they have a restaurant on the second floor. Beauties approved by Lucia Ortega. Food: Yes, all kinds. Price: $-$$ Food consumption necessary to be able to order alcoholic beverages? Not necessary. Another one by Zébulon Perron. This classic bar is perfect to go out celebrate. The terrace is in the alley by the entrance. Don't let its size fool you, great partying happens here... especially after 7 PM. Food: Yes. Order the chicken. Price: $$ Food consumption necessary to be able to order alcoholic beverages? Not necessary. This place is inside a building that still looks industrial and old, but the ambiance is modern and clean. The terrace is nice, very elegant. More Beauties favorites? Check these ones out!